Afghan Army – where is it going? 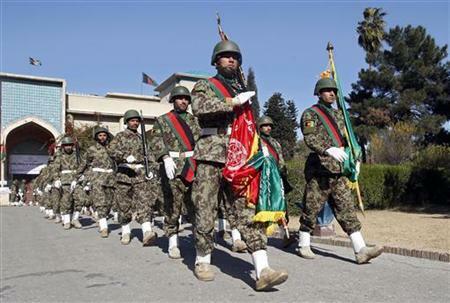 Summary: Many reports highlight the problems of the Afghan army. Underwritten with Western support, it is perhaps unwise to assume the ANSF is doomed, but it should lose its obsession with high-tech weapons until it really understands what it needs and can afford. The ANSF needs better combat support skills above all, but the real risk to the ANSF is more likely to come from less readily identifiable issues of loyalty and political control. I don’t get the feeling that high-tech weapons are the answer, despite the Afghan government’s obsession with them. 3. Perhaps this is evidence of what Thomas Barfield, a highly-recommendable cultural and political historian of Afghanistan, described as the attempt to gain favour, funding or resources by threatening collapse. 4. There is quite macho “war of words” with Pakistan on-going, including border skirmishes – do we really need more weapons floating around the border? High tech equipment is for people qualified and trained in its use – in particular how to maintain it. Once you buy in to high tech stuff, you also have to buy in to very long logistics trails of equally hi-tech spares and maintenance packages from which ever nation you are dependent upon. Afghanistan needs an army that maintains, trains, sustains and understands itself first, before asking for bigger and more expensive stuff. I struggle to see that the ANSF and air force will be any better at avoiding civilian casualties than Western troops if they are given the capability to deliver higher payloads. Come back for the high tech stuff in ten years – if they need it (and once they have done a proper defence plan). But I am not quite sure that the ANSF is doomed – which seems to be the general thrust of the media reports. If your benchmark of quality and capability is measured by a short timeframe and in comparison to Western forces, the ANSF will be found lacking, of course. But surely this force is better placed than Najibullah’s Democratic Republic of Afghanistan (DRA) army that the Soviets left him with in the late 1980s. I don’t have the best sense of DRA capabilities, but, from what I have read, it seems morale was low, equipment poor, low tech and poorly maintained, with high desertion rates. But it held out – after some early wobbles in confidence – against a much larger and more motivated jihad than anything the Taliban are able to generate. My understanding is that it was the collapse of the Soviet Union that caused the demise of the DRA, when the millions of dollars worth of food, salaries and equipment simply stopped coming from Moscow. Isn’t it fair to work on the assumption that Western funding, training and support will probably not collapse spectacularly in the way that the Soviet empire did – even if NATO nations are now counting the pennies much more closely? And we will probably expect to see something like 10,000 Western troops remain in Afghanistan for some years to come, which will provide some credible bracing against collapse. I am starting to think that the insurgency against the Taliban, although painful, could be manageable for the ANSF, as long as its loyalty and political control remain viable and intact. And this is an area much less focused upon.